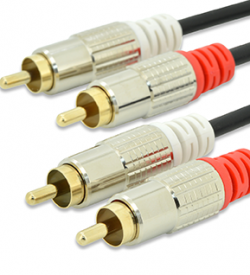 RCA cables | View our catalogue products | SiliconBlue Corporation Ltd.
RCA connection cable, 2x RCA, St / St, 1.5 m, stereo High sound enjoyment with stylish design, shielded, UL, si / bl, cotton, gold. This stereo RCA cable connects as the audio port of a satellite receiver, CD player, etc. to the amplifier. RCA connection cable, 2x RCA, St / St, 5.0 m, stereo High sound enjoyment with stylish design, shielded, UL, si / bl, cotton, gold. This stereo RCA cable connects as the audio port of a satellite receiver, CD player, etc. to the amplifier.